WOWZERS! This letter is long! Y'all must have really wanted to go out with a bang! A Very Happy Birthday today to Susie Overton Jones ('63) of VA! We're honored to have you with us, and to read your delightful stories! Is to have and to give a Happy New Year. Thanks, Tim. I'll keep plugging away..... Happy New Year! United Methodist Church, Winton, N.C., and was the widow of Hartwell Eason Cowan. Surviving are one daughter, Margaret C.
Wallace Sexton of Winton, N.C.; 11 grandchildren and 11 great-grandchildren. A graveside service will be held at 11 a.m.
at the funeral home at 10 a.m. Wednesday prior to service. Garrett Funeral Home Ahoskie, N.C., is serving the Cowan Family. Published in the Daily Press on 12/29/2004. You can click on the “View/Sign Guest Book” link and leave a message for Margaret and Bubba as well. Sigh. Thanks, Thelma. Our thoughts and prayers are with Margaret and her family at this time. Happy New Year, Brown Eyes! Thanks, Babe! Happy New Year! I found these tickets and thought they may be of some interest. I don't know on which page they may fit. Anyway, I know you don't need another project, sorry. Woodard and I hadn't been able to wrangle any dates (sad, isn't it?!? GIGGLES! ), so we went together. It was very exciting! Somewhere near the center of the cafeteria was a (gasp!) Kissing Booth! Who would have imagined it would have been allowed?!? Sometime near the start, someone (was it you, Steve?) began calling out, "Have you seen Graham yet? Graham Avery's here!" in with us! And Happy New Year! I hope you have already found a way to help, but if not, this is a good one. And may your New Year be a good one. Thanks, Joe. The magnitude of that suffering and devastation is simply beyond comprehension. Thank you for the information. I looked him up in the '60 Anchor, Jennie. He was a cutie-pie! Anyone have any information about Jackie? two new babies in the family that we had not seen before, as well as numerous other children all growing too fast! What a hoot to get a foot of snow on the 26th! Everyone was accusing us of "bringing it in from New England..."
we hunkered down with a jigsaw puzzle, something everyone could work on...ended up staying up until one a.m. to finish it! Did lots of eating and a wee bit of drinking... We returned to RI tonight and found our own snow melting (39 degrees tonight). It is a wonderful web site and newsletter...don't change a thing! Those beautiful songs on the newsletters take my breath away! your mama - and that you had such a good holiday. It's good to know you're enjoying the music, too. I think they're fun - especially when David finds them, as he did this one! This is very interesting! NOTHING IS GOING TO JUMP OUT AT YOU TO TRY TO SCARE YOU, I PROMISE! below link. What happens is pretty interesting. It's also amazing how quickly it computes!! Very cool. without question the very best! Have a wonderful New Year's. dream to me! Never could I have envisioned all that's transpired since that moment. In a very real way, you inspired it all. Thank you so much - for everything! commenting on reaching 75. Following is something I sent the day before I crossed over. Yeah, talk about small world, AND when I saw Bobby (Turpin - '58) just a while ago, we had a discussion about this! yearbook, as my dad didn't have one!! Amazing, isn't it! I'm still giggling! into this amazing place to go to see all kinds of pics, etc. I can't tell you how many memories it has given me back!! AHA! There you are, Miss Sarah! GIGGLES!!! Yes, that must be my favorite small world story yet! has been for me! Happy New Year! Ever walk down the street and suddenly see yourself coming toward you? I was poking around in one of those web search engines and suddenly came across myself. Deja-vu!! In a lifetime, everyone gets 5 minutes of fame. Hope this was not my one shot. while I was home for my 35th Reunion in 2000. And now here you are with us! What an amazing journey! Thanks, Fred! which is now retired and in San Diego being made into a floating museum. I realized there was more to my story, so I let it all come out. The result is stitched on below. the main story was retained. Did I tell you I was a sailor? Don't remember doing that, but at age 76 the RAM plays tricks sometimes. 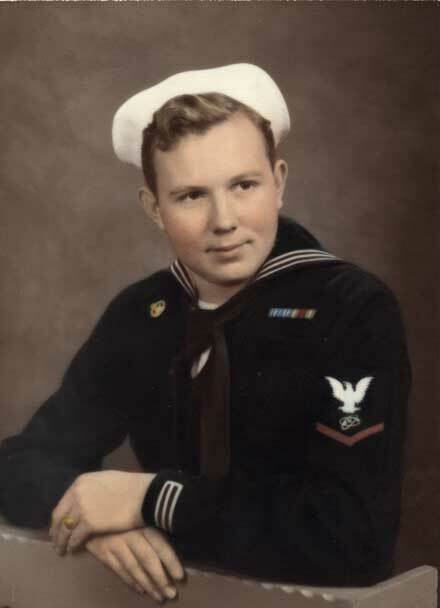 Anyway, I'll attach a photo of me taken in Dec. 1945, a few days after my enlistment in the Navy. OH, how adorable! Thanks, Fred - I just added this to our Famous Sailors page! which showed me that you were. GIGGLES!!! The USS Midway article was of special interest to me. In a very small way I helped build her at the Newport News Shipbuilding and Drydock Co., Newport News, Virginia (my home town). employment I learned that the shipyard would take anyone 16 or over. I was soon hired as a machinist helper. welded to the deck of the Midway as anchor points for hundreds of equipment cabinets. in great demand. We routinely worked 6 days a week. In Sept. I left the job to begin my senior year of high school. graduated from high school and returned once again to the shipyard, this time becoming an electrician's helper. the flight deck was 900 feet - three football fields long!. was still drilling those steel bars. He said they would be used for Coral Sea, sister ship of Midway, and now under construction. In September 1945 the war was suddenly over. Midway was commissioned a week later and soon left Newport News. Now at age 76 I plan to visit my old friend once again. I'll be looking around for those steel bars. WOWZERS!!! What a cool story! Thanks again, Fred! And Happy New Year! was also there the day my darling cousin (Cookie Phillips Tyndall - '64 of VA) tried to drown. It scared me half to death. One minute she was standing there and then, all of a sudden, there was a crowd and she was lying on the side of the pool. me pretty busy in those days. What a life we have had. God Blessed us -- everyone! Yes, He did! Thanks, Judy! Happy New Year! Hi Carol! So good to read the news letters and catch up. would have gotten the luggage had he not gone out to the airport. my job again to play with the grandsons. Now we all know that is a choice I will make very easily! Ah, welcome to the Frozen Tundra of Illinois, Dee! WILD GIGGLES!!! Thanks for your great story - and Happy New Year! when I was in college and I also took piano lessons from one of the Nachman's. What a wonderful family! Absolutely! Thanks for your nice remarks and warm memories, Jo Ann! Happy new Year! Marsha, that is soooo cute! What a perfect close-out to our year! Thanks so much - and Happy New Year to you, too! Well, Sweeties, I'm going to have to cut this off, or we'll still be here when the new year breaks. Y'all have a safe and wonderful Happy New Year - and take care of each other! TYPHOON FOREVER!